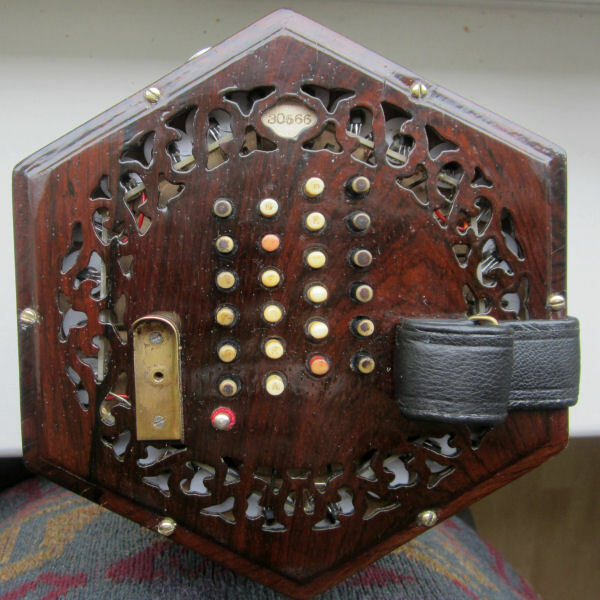 This is a conversion to the MIDI (Musical Instrument Digital Interface) standard of a Lachenal English concertina from about 1889, which was in a poor state. 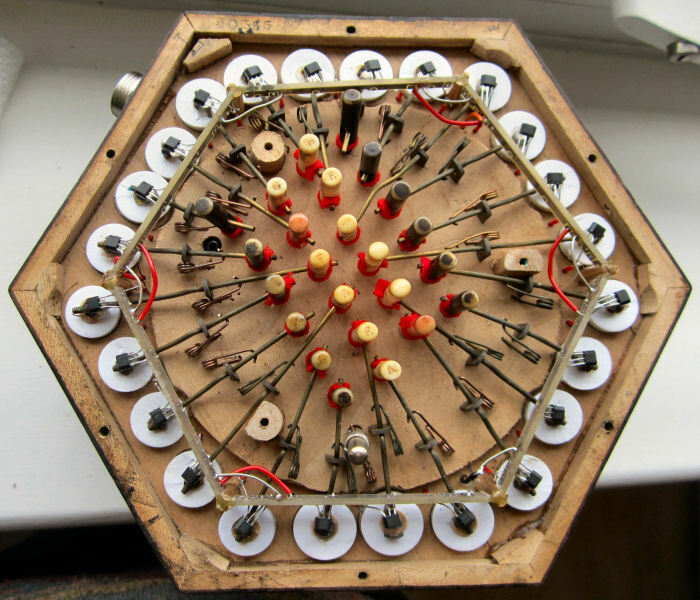 For information on the original instrument, see the page on Paul Hardy's Lachenal 30566. The conversion was done by Roy Whiteley of Accordion Magic. 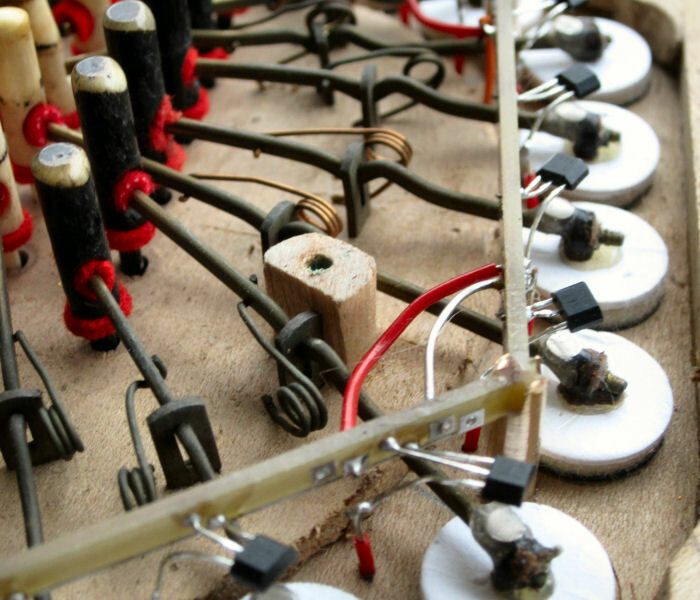 He removed the reed pans intact (so the conversion could be reversed), and added electronic sensors feeding an embedded microprocessor. The existing buttons, action and pads are used. 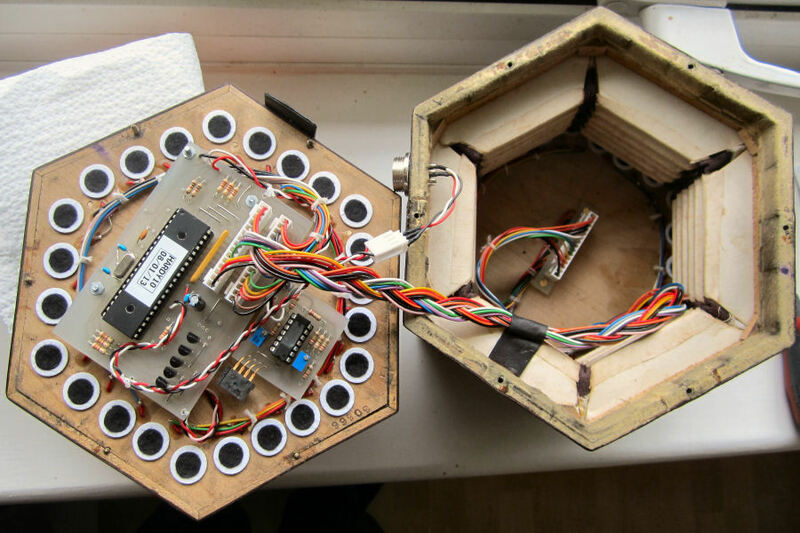 Each pad has a small magnet added, which when it approaches a sensor positioned above it, triggers a 'button down' event. The photos below show the installation, the action, the sensors, the side view, the end view, and the complete assembly. 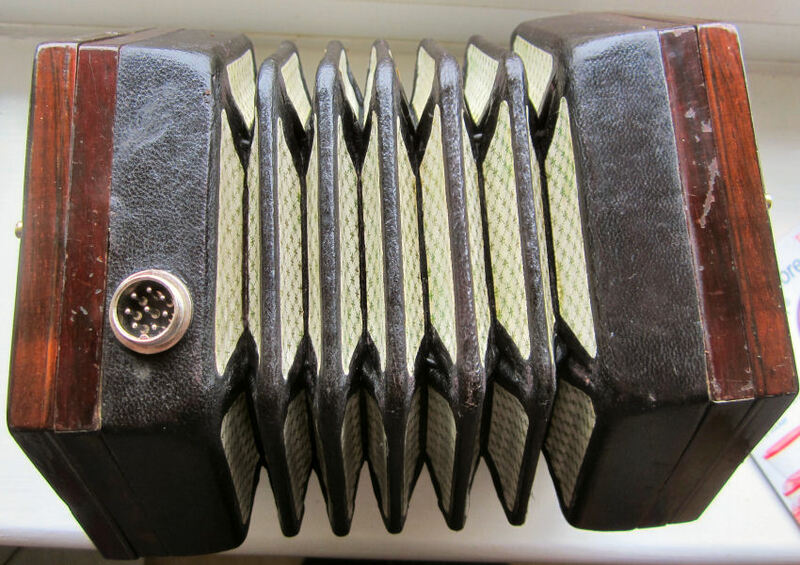 Roy provided a cable from a connector mounted in the left end side of the concertina, which goes to a small box with a MIDI out socket. The original cable box had a further hard-wired cable to a mains power supply unit, but I got Roy to do another similar and shorter cable where the box had a USB Mini B socket to accept power either from a mains USB charger, or from a portable power unit (Lithium battery pack - mine is a TeckNet iEP380 Power Pack). There is an extra button added which is used to specify controls for the MIDI output. The program in the embedded microprocessor manages up to three MIDI channels, sending button up/down events and expression (volume change) on enabled channels. 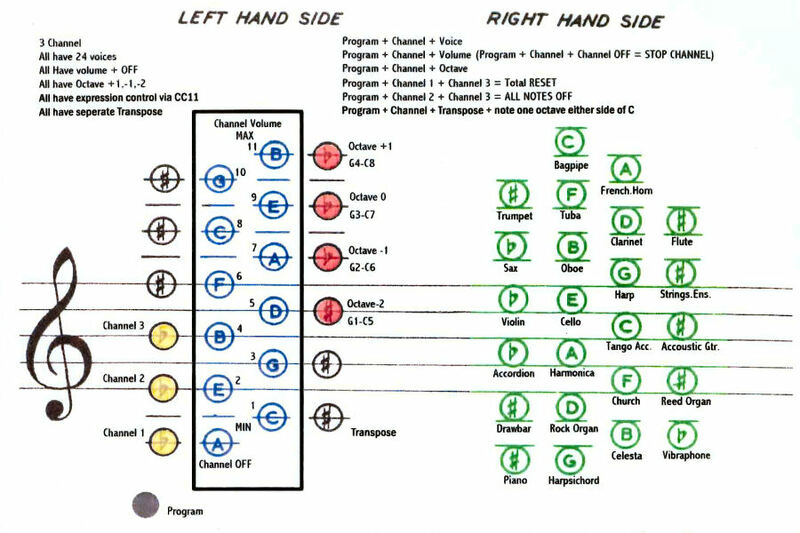 Initially just Channel 1 is enabled, but by using the control button in combination with other buttons, one can set volume, octave, and transposition indepenently for each channel. The three buttons immediately above the control button say which channel, then the buttons on the right side select one of 24 instruments. Similarly, Control plus channel plus the white keys on left side set volume level for that channel, while the black keys set the octave and/or trsnsposition. In practice, I find I use the controls to set up the octave for each channel, then do the other MIDI selections (such as instrument) on the synthesizer. In the past, a MIDI instrument such as this would have needed specialist MIDI sound generator (synthesizer) hardware, often from Roland, Yamaha, etc. Also, trying to use a PC as a synthesizer didn't work well, because of latency (delays) in the communication between the various levels of PC software. However, the iOS operating system combined with the fast CPU of the iPad can process MIDI to sound without noticeable latency. Additionally, the Apple 'App' marketplace has fostered the availability of several cheap and useable software synthesizer programs. I mainly use Bismark BS-16i. BS-16i is a 16 channel multi-timbral playback sampler. It uses a free synthesizer library called GS SoftSynth, which provides a full set of General Midi (GM) standard instruments. It supports SoundFonts, so can load new instrument sounds. I have also experimented with ThumbJamb, and with Apple's GarageBand, both of which can be driven directly by the instrument. The iPad does not have a Midi port, nor a USB port. However, the Apple 'Camera Connection Kit' does supply a USB port which works with some Midi to USB convertor cables. I found and prefer a single connector, called the iRIG MIDI, which does MIDI to the iPad dock connector in one go. 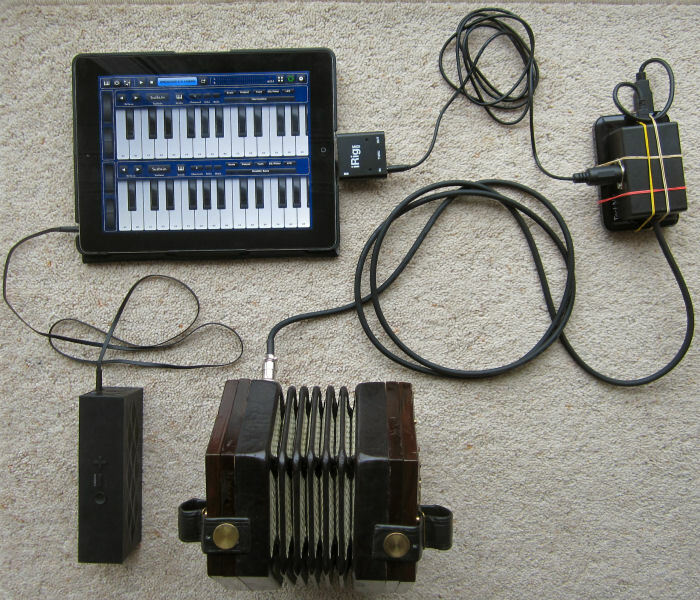 So, my complete assembly illustrated in the picture above, has the MIDI concertina, the cable to the socket box, a USB battery pack (attached to the box with rubber bands! ), then the iRIG MIDI unit, plugged into my iPad. That is sufficient to hear the instrument, or one can plug in headphones to the iPad as usual. However to be heard by others, a speaker is needed, and I bought a Jawbone Jambox. This is a battery-powered amplifier/speaker unit, supporting Bluetooth wireless connection to the iPAD. This works well when playing recorded music. However the Bluetooth protocol intoduces a half-second latency delay, which is sufficient to wreck ones reflexes when playing live. So, I use a standard headphone cable (3.5mm jacks) to connect the Jambox to the iPad. In BS-16i, I can save 'scenes' which are sets of configured instruments for each channel. For example I have one which has Harpsichord on Channel 1, Cello on 2, and Flute on 3. I then set the concertina to put channel 2 two octaves down, and channel 3, one octave up, and the result is an interesting combination of sounds from a single button press. You can listen to me explaining and playing combinations, and also playing the Fiery Clock Face. I'm very impressed with Roy's conversion, and the iPad is an excellent software synthesizer platform, with good and cheap synthesizer software.